The PLP are hiring for a raft of new positions, announcing spending initiatives and solving pressing issues by increasing spending. They say they are spending money that was already budgeted for and are blaming the OBA for un-budgeted spending. This is all fine and nice if you ignore the bottom line. Will we see a reduction in the deficit this year and a balanced budget next year as promised? 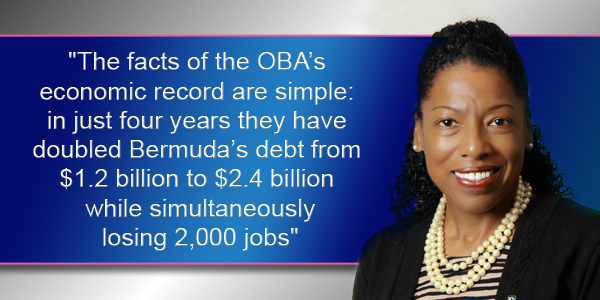 In opposition, the PLP liked to highlight the growth in the debt under the OBA. This was politically convenient as it ignored the rather sizable deficit the PLP left behind from their last time in government. It ignored how impossible it is to prevent the debt from increasing when you have a considerable deficit. It ignored that in order to quickly reverse the trend, massive cuts would have had to have been made. The PLP held the OBA to account for all increases in debt regardless of the cause and this could come back to haunt them. Not only do we have more interest payments to make but if we can’t manage to balance the budget, the problem will only get worse. The PLP blamed the OBA for our increases in debt. The PLP are blaming the OBA for un-budgeted expenses. However using this to excuse budget overruns and an inability to reduce the deficit may seem convenient, but it won’t change the bottom line. The OBA didn’t win 2/3rds of parliament and they aren’t the ones now holding the purse strings. The OBA aren’t the ones in the position of having to make the hard decisions of where not to spend money in order to reduce the fiscal burden The OBA also didn’t convince the population that any increases in debt are unacceptable. Blaming the OBA is all fine and good, but it won’t balance the budget. The bottom line of improving tourism isn’t just more visitors, it’s also more spending. Much of the focus and energy tourism evangelists and practitioners place into improving tourism is improving visitor numbers and not nearly enough goes to improving visitor spending. It serves as an injustice to the true picture we should be caring about most: how much money ends up in our pockets. Sadly Bermudians have been trained to measure success in tourism by visitor arrivals. This is a flawed approach, likened to measuring the success of a retail shop by how many people come in to browse. Now certainly, a shop which is always empty is no hallmark of success. Neither though is a shop that is always full of people who never buy anything. In this analogy, Bermuda represents a small boutique shop competing against mega retailers. We need to tailor our strategy accordingly. If we fill our shop with non-spenders we will drive away premium shoppers who hate crowds. If we don’t offer quality products then our shop will sit empty as no one wants to spend more for things of less value. Thus it is critical that we find a balance where we can maximize revenues. If you look at the latest tourism statistics you can see a focus on visitor arrival numbers front and center on the first page after the title page. Sadly we aren’t helping ourselves disrupt the stigma here. We can see that as of the end of Q2 this year there were over 210,000 visitors and we’ve seen a decline from 2014 of 1%. By this measure the new Bermuda Tourism Authority, despite all their funding and pizazz, is failing. However, arrival numbers shouldn’t be what we care about. We need to focus on what visitors to our shop are spending, not how many come into it. In more recent statistics visitor spending now dominates a much more prominent position and in this report sits on the 4th page. This is a very welcome change as expenditure is what should be highlighted. The visitor spending numbers paint a very different picture thus far for 2015. The average visitor spent $41 dollars more in the year up to Q2 in 2015 vs. 2014. This is a very good improvement of 7%. If we take the “Estimated Economic Impact” numbers at face value (no justification for the calculation used to generate this number was provided), we see an estimated impact of $74.4 million, $3.4 million more than 2014 and representative of a moderate 5% growth. Spending over Arrivals should be the focus of our attention. By measure of arrivals, the new Tourism Authority is decried for not improving the picture, however by measure of expenditure an entirely different story is told. Quite sadly the Tourism Authority, the government and the local media are not doing enough to focus the populace on the correct part of the story. Visitor spending is up, revenue numbers are up and this means we’re generating more money for less people in our little boutique shop. This is a good thing which should be celebrated and sadly it is not. Visitor spending must be our focus not arrivals. Bermuda cannot and will not ever be able to compete with the discount megastores of tourism. We shouldn’t even try. Bermuda can and should reposition itself to improve the quality of its product and offerings so that it can maximize the revenue it gets from a smaller number of people. Our latest example of spin comes from today’s paper where Senator Dunkley of the United Bermuda Party where he highlights the incredible drop in visitor spending from 2007 to 2009. Mr. Dunkley is indeed correct in his analysis however one could be forgiven for questioning why he compares against only the last two years? Indeed, looking back to 2001 through 2006 tells a different story than the picture he paints. That doesn’t lend itself to his argument now does it? When tourism was on its way up, the incumbent could do little less than to spin numbers in every way possible to accentuate the job they were doing, conversely now that tourism is on its way down the opposition is taking the opportunity to spin things the other way. Politicians. Looking at tourism numbers there is no denying that we’ve seen significant declines since 2007 highs. Analyzing since 2007 however doesn’t paint a complete picture. Let’s take a look at an old chart we put together back in 2007. Admittedly numbers are only presented for the first 3 quarters however a comparison of 2009’s $276 million vs. 2007’s $414 million in visitor expenditure paints a rather incomplete picture. Noting the above chart we can see annual tourism expenditures and how Bermuda had a pretty poor few years from 2001-2004. Is it not a bit ingenious disingenuous to leave such years out of your analysis and simply compare against the best recent year while leaving out the details for the previous few? Though of course, doing so would lessen the dramatic effect now wouldn’t it? 21 Square is a collection of thoughts and opinions on Bermuda by Bermudian Denis Pitcher. It is not the intent of the author to diminish in any way the valuable service and sacrifice made by our elected leaders. By no means are these ramblings to be considered anything more than the off the cuff opinion of an armchair critic getting some writing practice. Coming up with ideas and talking about how things could be done is incredibly easy. Actually doing them is the incredibly difficult part. Thoughts on the contributory pension fund shortfall. So what happened with the changes to the bus schedule?